Hugh Miller (1889-1976) was one of several people from Berwick-upon-Tweed who made distinguished careers in the theatre and cinema. Hugh Miller in a film publicity photograph for The Love of Sunya (1927), starring and produced by Gloria Swanson in America. Hugh Lorimer Miller was born in Berwick-upon-Tweed on 22 May 1889. He was the eldest son of Alexander Lorimer Miller and Jane Hartforth Miller (née Short). His father Alexander was a prominent auctioneer in Berwick, and he also served as a Justice of the Peace and the secretary of the Berwick Corn Exchange Company. The 1891 Census shows Hugh living with his parents and younger brother Alexander at 25 Palace Street. Hugh’s mother Jane died 14 February 1895; in her will the home address is given as 8 Ravensdowne, Berwick-upon-Tweed and she left effects to the value of £312 10s to her son “Hugh Lorimer Miller actor”. In 1901, Hugh was living with this father and brother at 44 Castlegate. Alongside his stage performances, Hugh Miller started getting parts in silent films in the early 1920s, including The Prude’s Fall (1925), scripted by the young Alfred Hitchcock. In the days when silent cinema facilitated European co-productions, Miller also found himself filming in Germany and Italy. The logo of The Film Society, founded in London in 1925. In 1925 Hugh Miller became a key figure in the foundation of The Film Society, the first of its kind in Britain and an important influence in promoting independent and artistic cinema. Ivor Montagu, the left-wing filmmaker and critic, recalled in his autobiography how the idea had begun when he met Hugh Miller on a train from Dover to London. Hugh Miller was “an extremely handsome man [who] had been playing lead in a joint Anglo-German production in Munich… [We] got into a talk and before we reached Charing Cross decided that what London needed was a Film Society to show pictures which were worthwhile for one or another reason but could get no commercial showing, just as the Stage Society did plays.” (The Youngest Son (1970), p.268.) The Film Society continued to operate until 1939, by which time the film society movement had been established around the country (including the Edinburgh Film Guild in 1929), and its work was also taken up by the British Film Institute (1933) and the National Film Library (1935). Hugh Miller’s involvement in setting up The Film Society was energetic but brief, because later in 1925 he and his wife moved to America to appear on stage in New York. According to a report in the Boston Daily Advertiser in 1927, Hugh Miller enjoyed success on stage as Mr Jingle in the adaptation of Pickwick. His first American screen role was alongside Gloria Swanson (then one of Hollywood’s most famous stars) in her own production The Love of Sunya in 1927 (Berwickshire News, 31 May 1927, p.8). In 1929 the Millers worked on another New York stage production, The Novice and the Duke, which was a modern version of Measure for Measure, written by Olga Katzin and featuring Hugh Miller in the role of Lucio. 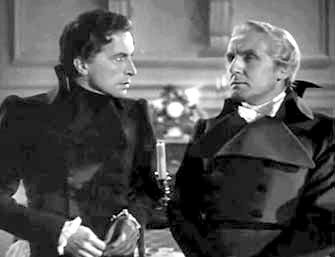 Hugh Miller (left) and Henry Oscar in a scene from the British film The Return of the Scarlet Pimpernel (1937). Oscar was playing the role of Robespierre and Miller was his secretary De Calmet. The Millers remained in New York for nearly ten years, and among the acquaintances that Hugh Miller met there was Henry Travers, another expatriate actor who had grown up in Berwick (now commemorated in The Maltings Studio). Back in England in the mid-1930s, Hugh Miller continued his career principally on stage in the West End and elsewhere. He also took occasional roles in British films, which included playing King Charles I in The Vicar of Bray (1937), and Disraeli in Victoria the Great (1937). 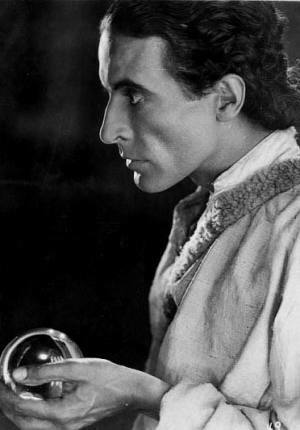 While filming in Italy, in the role of Paganini in The Divine Spark (1935), he found a different kind of celebrity when he heroically brought a runaway horse to a standstill in a crowded Rome street – and his exploit was widely reported in the press. Hugh Miller made periodic return visits to Berwick which did not pass unnoticed. In 1923 when one of his early silent films, The Letters, was being shown, it was promoted as featuring “Berwick’s own screen actor” – and since he happened to be in town at the time, he made a personal appearance at The Playhouse to thank the audience. His holidays and casual visits to Berwick would also be reported by the local newspapers, such as one in 1941 while he was on tour in Scotland with a stage production of Rebecca; on this occasion he was staying with his cousins Mr & Mrs McCreath in Wellington Terrace (Berwick Advertiser, 20 March 1941, p.3.). In 1951 Miller collaborated with Alan Melville (another theatrical personality who came from Berwick) on a revival of the operetta The Dubarry; Melville wrote some new lyrics for the work and Miller directed the theatre production. Hugh Miller’s final screen appearance was in the supporting role of an army colonel in David Lean’s film Lawrence of Arabia (1962). He died in London on 1 November 1976, aged 87. Hugh Miller married Olga Katzin in 1921. Olga was born in London on 9 July 1896 to Russian-Jewish parents; her parents were Isaac Itzhak (John) Katzin, born in Lithuania, and Matilda Maud Litoun, who was born in London, with family roots in Czechoslovakia. Olga grew up in London and South Africa. She returned to London to study drama, and in 1920/21 she appeared in a number of classical drama productions as part of the London Greek Play Company (of which Hugh Miller was the manager). In 1923 she performed in a Shakespeare festival in Stratford-upon-Avon. Olga and Hugh Miller moved to New York in 1925, where both of them established themselves in the theatrical world and they continued living there for nearly ten years. 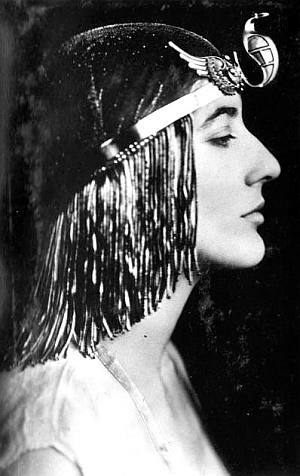 In this period Olga began publishing books of poetry and also wrote several plays, including The Novice and the Duke which was produced in 1929. After their return to Britain in the mid-1930s, Olga Katzin’s writing career flourished. She developed a form of satirical socio-political verse which was published in magazines and newspapers, as well as in a series of books. For twenty years she wrote regularly for the New Statesman under the nom-de-plume Sagittarius, commenting on topical issues in humorous verse. She also wrote as Fiddlestick for Time and Tide, as Mercutio for the Manchester Guardian, and as Scorpio for the Daily Herald. Her many books included Sagittarius Rhyming (1940), Quiver’s Choice (1945), Let Cowards Flinch (1947), and Up the Poll: the Sap’s Guide to the General Election (1950). Olga Katzin died on 6 January 1987 at the age of 90. With Hugh Miller she had three children: Sonya (b.1924), Gabriel (b.1928), and Jonathan (b.1936). An obituary notice for Olga Katzin in The Times described her as “one of the wittiest of modern satirical versifiers” and “a strikingly handsome woman, elegant and charming, relaxed and well-informed in conversation, hospitable at home, and always quickly aware of social injustice wherever she saw it”. The same notice remarked that her late husband Hugh Miller had been “an English actor of great versatility, an authority on Dickens who scored a still-remembered success in New York as Mr Jingle in Pickwick“. UK Census, England & Wales. National Probate Calendar (Index of Wills and Administrations), 1858-1966, 1973-1995. New York, Passenger Lists, 1820-1957. The Times, 11 February 1987, p.14: “Sagittarius” (obituary). A list of Hugh Miller’s cinema credits can be found on the International Movie Database.